Who is as powerful as Lord Shiva in this world. It is Maa Shakti. Our Guru – Mata is the living epitome of Gurudev’s power. When Gurudev left to find His identity, first day after His marriage, no one knew, that when He will return. Mataji waited, patiently for Gurudev to return, all the while knowing in Her heart that He will return. She used to pray for His well being where ever He might be. Gurudev returned and gave Mataji, Her deserved honour and respect. Her belief in Him had proven to be true. She gave full support to Gurudev in the years, when He was still gathering His powers and She also worked as a teacher in a School. When “Seva” started at the Sthaan (The residence of Gurudev), Mataji was over-whelmed with joy. Everyone used to get motherly love and affection from Her. She was with Gurudev at every step. When Gurudev used to sit for “Seva”, He used to sit for hours together, sometimes more than 24 hours at a single stretch (meeting more than 60 thousand people) WITHOUT eating anything. She used to eat after Him. When Gurudev decided to leave His human form at His own will, He asked Mataji to go to Neelkanth Dham (The place He had earmarked for His Last rites to be performed), one day before the appointed day of his departure, to light a “Jyot” (lamp) at the place where His samadhi was to be made. It was only Her Divine Powers that enabled Her to perform this difficult task. Though Gurudev is always there with everyone as He said – That He resides within us, everyone misses His engrossing Human Form. 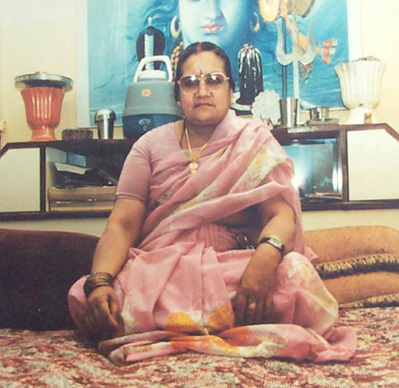 Mataji, with Her love for Her children, never let them feel deprived of that pleasure for several years. She used to meet everybody with the same enthusiasm. Her presence provided a sense of security to Gurudev’s disciples until the day She too joined Gurudev and left Her Human form to be Omni-present. She left Her Human form on the 2nd of May 2014 (on the day of Akshaya Tritiya) just a day after Her birthday. She will always be the guiding light in our lives. Gurudev’s Shishyas, as per His Aadesh, now ensure that Sewa is carried out at the Sthaan just as the way He wanted.